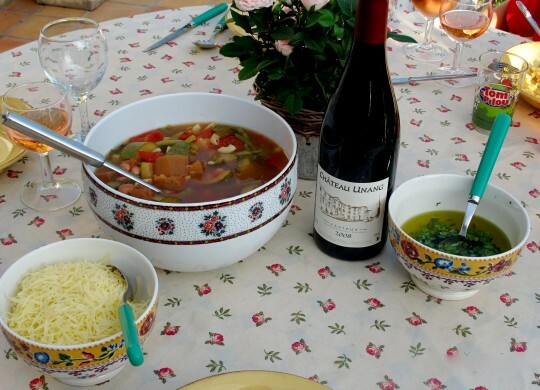 Everyone in Provence has his or her own recipe for the classic Provençal vegetable soup, “La soupe au pistou,” made from a market-fresh assortment of beans, eggplant, tomatoes, zucchini, potatoes and onions along with a small amount of macaroni or pasta, and cooked slowly to imbue the soup with smooth velvety flavors. Whatever vegetables go into the pot — and one distinction in Provence is that the soup is often prepared in a “Cocotte minute” (pressure cooker) to lock in the flavors — the de rigueur ingredients for making a pistou sauce, served cold, are garlic and fresh basil crushed in olive oil. And without a doubt, the pistou is served as a condiment, not as a sauce (the difference between a condiment and a sauce is that the latter is added by the food preparer, whereas a condiment is added by the eater). Breaching this tradition was a recipe on the Food Network provided by Wolfgang Puck that called for some pistou to be mixed into the soup before serving. In Provence, this would be considered barbaric as the particular amount of pistou added varies to taste of the eater — some add a drop, other go for a tablespoon or more. Grated hard cheese – picorino, parmesan, or gruyere among others – is also served as a condiment. Interestingly, this is one dish that one consumes without a baguette. 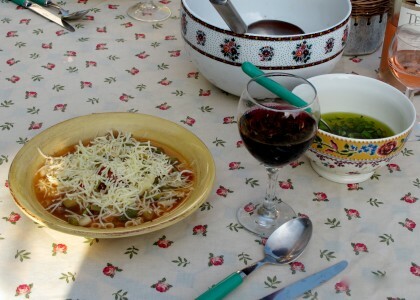 “La soupe au pistou” may be paired with either a red or a white wine. The fruit-forward AOC Ventoux red wines with a clean finish pair nicely with the hearty flavors of la soupe au pistou. An exemplary estate-bottled AOC Ventoux is the “Ventoux” vintage from Château Unang, a medium-bodied red wine with fresh notes of cherries and raspberries, and soft tannins. A blending of roughly 60% Grenache, 30% Syrah, and the rest Carignan, the wine has a dark purple color. Nested in the verdant hillsides and enveloped by forests in Malemort-du-Comtat in the Vaucluse, the once dilapidated Château Unang took a king to put it all back together, in this case two kings: Joanna and James King, once of Scotland, via Beijing and Brussels, who purchased the vineyard in late 2001 with grapes harvested. 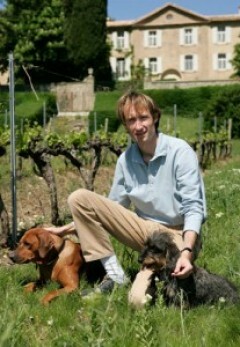 By 2003, they had moved south with their spawn to renovate the chateau and to nurture the vines back to form. As for white wines, most produced in the Vaucluse lack acidity and body due to the lack of cool nights that protect acids from being lost through the biochemical process of respiration. A perfect pairing with “La soupe au pistou” is a Pinot Gris (Alsace or Oregon): a lush wine, Pinot Gris is not overall fruity, possessing flavors of peach, pear, grapefruit and a bright finish with well-balanced acidity. One exceptional bottle from Oregon is the 2009 estate Pinot gris from The Eyrie Vineyards: a dense texture, a nose of melon, spicy florals and mineral notes and a bright finish. Château Unang: Cellar open Mon.- Fri. 2-5 p.m., Sat. 10-12 p.m. See website for directions. This entry was posted in Food, Wine and tagged Pairings, Wine. Bookmark the permalink.